Nightguards (occlusal guards) protect our teeth during the night from clenching or grinding (bruxism). When orthodontic treatments or reconstruction of the mouth are not treatments that are feasible, a nightguard is an economical and easy way to protect the teeth and the Tempromandibular Joint (TMJ) during the night. Nightguards can last for many years and are precision-fit to be comfortable and not damaging to your existing teeth. 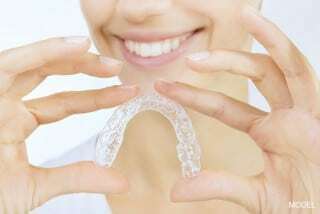 Often, the store-bought nightguards can be uncomfortable and may actually shift the teeth with long-term use, necessitating orthodontics and additional dentistry. It is recommended that if you want to use a store-brand nightguard, please contact your dentist to make sure it will not cause any future harm.